Chili Cheese Dip | I Wanna Bake! I don’t recall what had me craving hot, cheesy dip (not that anyone ever needs a reason to crave that), but it became a bit of an obsession leading up to New Year’s Eve. Fortuitously, my husband gave me this set of covered casserole dishes from Sur la Table for Christmas, so I had the perfect excuse to give this dip a shot. I’m a bit obsessed with the set, to be honest. The ceramic is almost half an inch thick (great for even heat distribution), and the lids that come with them make a surprisingly good seal. I’d definitely recommend trying them out if you feel like splurging on bakeware. But back to the recipe at hand. 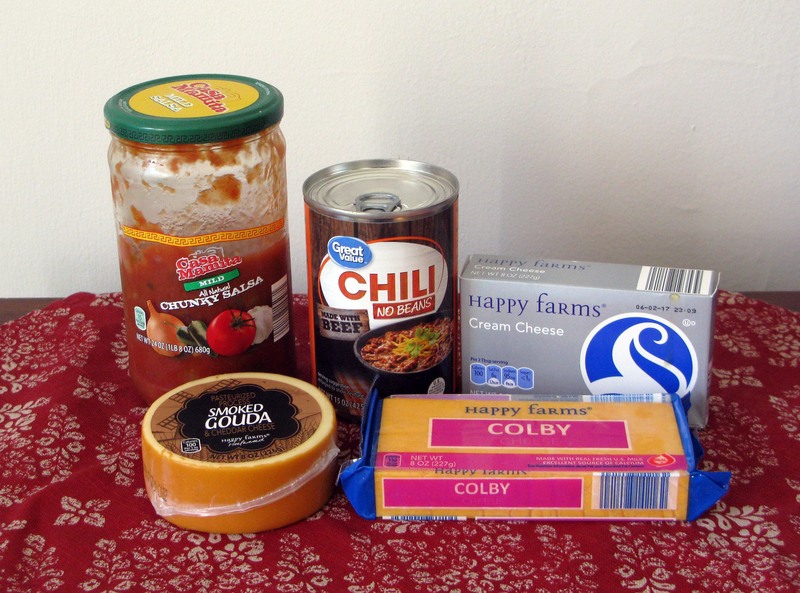 This recipe really only has 4 main ingredients: cream cheese, salsa, chili, and cheese. You can play around with those ingredients however you’d like. Have some homemade chili on hand? Use that instead of canned. Don’t like salsa? Leave it out. Looking for more heat? Add some chili powder or chopped jalapenos (or ghost peppers if you’re a masochist). 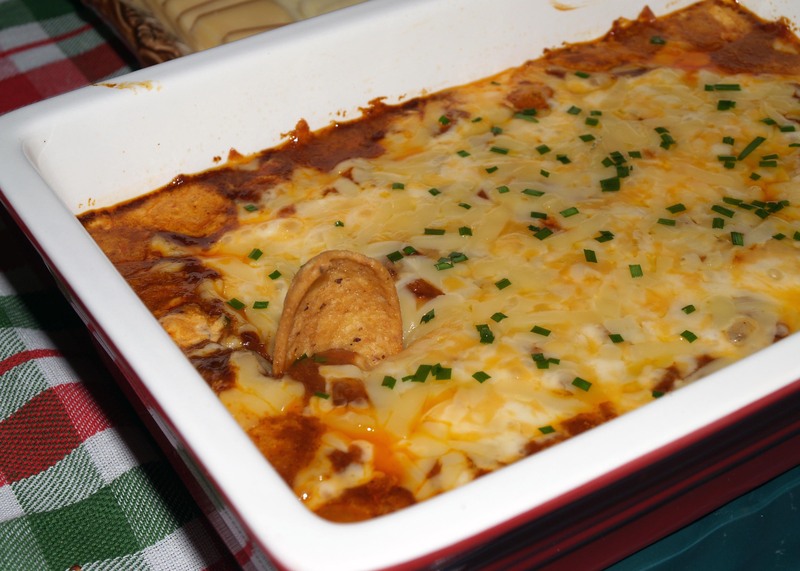 Feel like making it chili cheese dog dip? Chop up a hotdog and mix it into the chili layer. My only caution is in regard to the cheese. I will advise that you make sure to use a cheese that melts well (anything in the cheddar family, for instance), and that you grate your cheese uniformly. I used a mixture of smoked gouda and colby jack, but I grated them with different-sized graters, so the cheese didn’t melt evenly. Finer grating will help speed up the process, but medium will work just fine too. One final note: this dip will be a soupy mess if you dig into it right away. I found that it set up considerably after about 20 minutes. If you’d like, you could probably get away with baking the dip early, refrigerating it, and then reheating it before serving. Otherwise, just let it sit for a bit before serving, or take your chances with chili soup-still tasty! This dip takes so little time to make that it will probably take more time to choose and put on music than it will to prepare. Don’t overthink it. Just put on your favorite Pandora or radio station and go with it. Preheat your oven to 325°F and grease a 1.5 quart baking dish. Set aside. 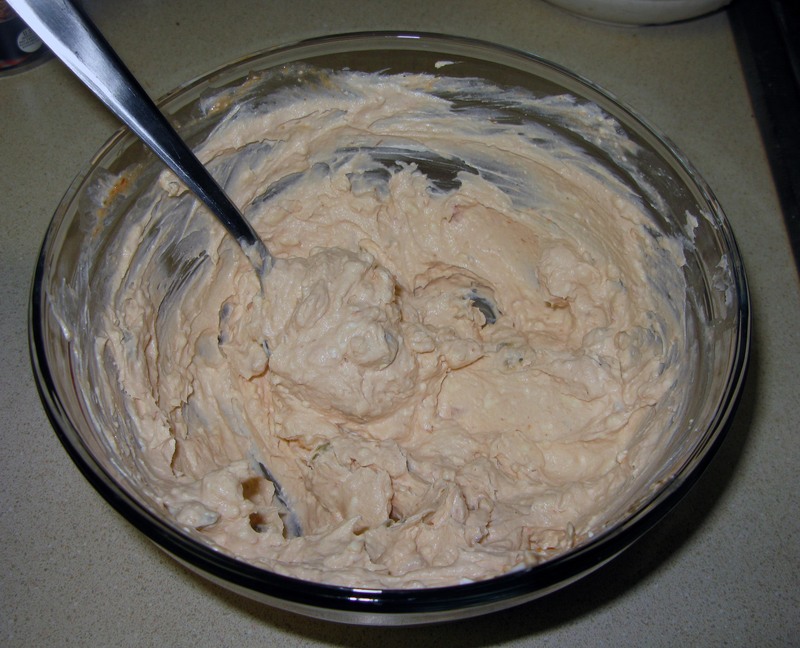 In a medium bowl, stir together the cream cheese and salsa until smooth (it will still be chunky because, well, salsa tends to be chunky, but there shouldn’t be any white lumps or unincorporated cream cheese left). 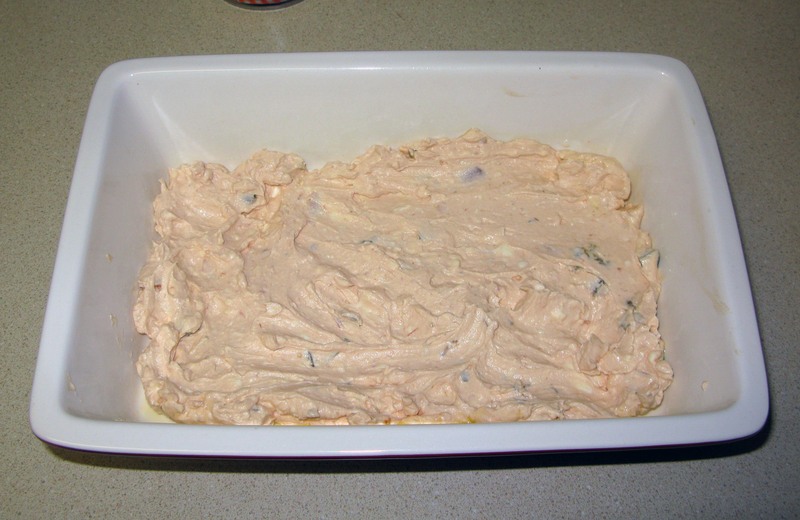 Spread the cream cheese mixture evenly over the bottom of the baking dish. It doesn’t have to be perfectly smooth, but it should be the same thickness across the whole dish, more or less. Spread the chili over the cream cheese layer (same deal). 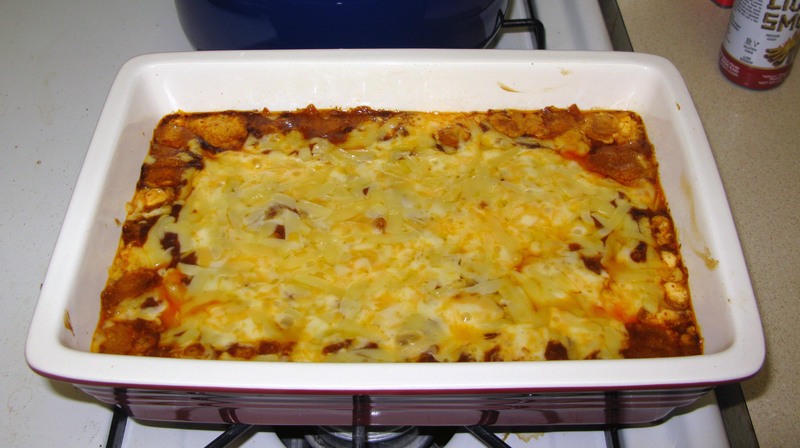 Toss together the grated cheeses and spread them on an even layer over the chili layer. 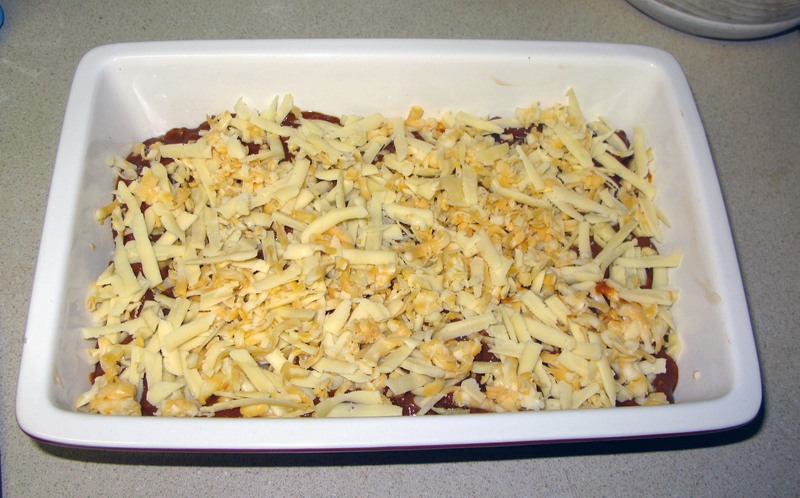 Cover the baking dish with foil and bake for 25 minutes (at this point, the cheese should be mostly melted). Remove the foil and bake for 5 minutes longer, until the cheese is fully melted and the dip is bubbly. 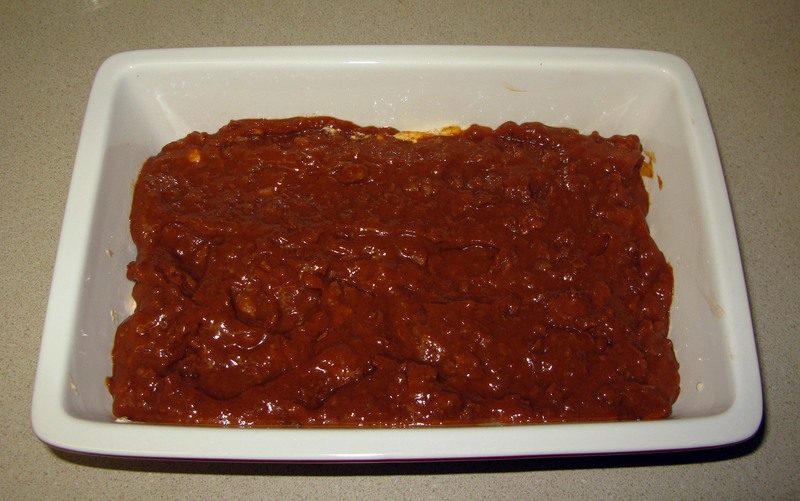 Remove the dip from the oven and let cool for 20 minutes (this allows it to set). Garnish with green onions or chives and serve warm with corn chips or crackers.